After that, we went shopping for dresses for her homecoming dance that is at the end of the month. Not really her schools but her boyfriends. We couldn't decide on the dresses so we took pictures and she is sending them to her boyfriend to help her pick one out. Here are the choices. 2. This one is my favorite. 3. With this one as a close second. So...opinions? Sisters, I know you will be looking so tell Megan your thoughts. We had fun today. After clothes shopping we went to the grocery store to pick up a few things for dinner. After dinner, we played DDR (Dance Dance Revolution PlayStation Game) It was quite the workout. She is going to be my exercise partner we have decided. Not that she wants to lose weight, she wants to build muscle. Tomorrow we are swimming. So...I shall be looking for opinions on the dress. Please comment so we can get a general census. 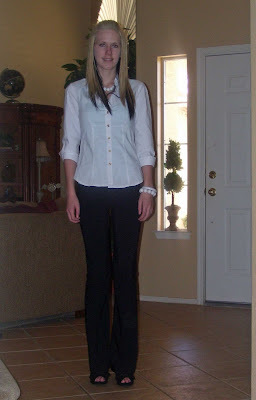 Except for the jewelry and the opened toed shoes, Megan looks dressed like Aunt Sandy in her business attire. Hi Cindy, I am a fellow Thelatesttrendsinmixedmediaarts, and I am a newbie just like you, joined a couple of days ago. Anyway, your right it is a tough choice between 2 and 3 but my pick would be 3, it doesn't take away from her face and it shows off all her great features. Can't wait to see what everyone else thinks. #2 & #3, I agree. A size zero?? I'm pretty sure I was born bigger than that-lol! She's a beauty, and culd wear any of those dresses & be a hit! Absolutely......you are right on as to which is the most gorgeous on your LITTLE doll. The least is number one. something about it is not right. #2, #3, #5 in that order. How CUTE is she?!!!! What a fun Mother, Daughter time. Number 2 for sure! Of course she looks beautiful in all of them. Thanks for sharing. Definitely the red first, then the black...tiny, pretty little thing!